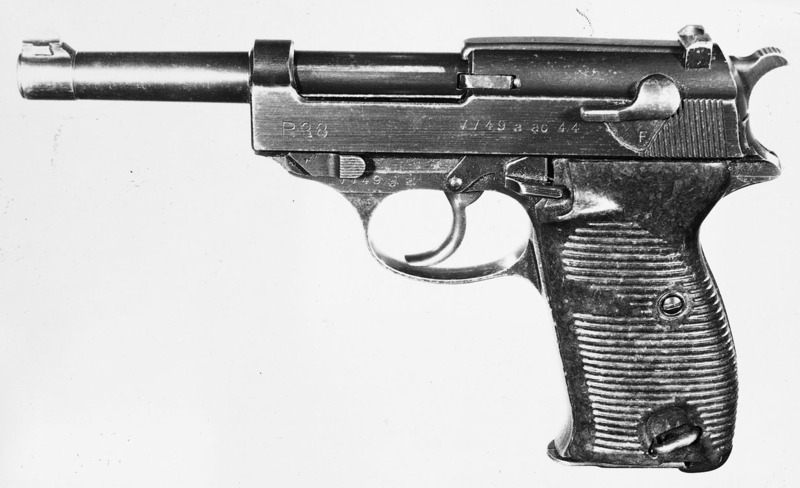 The Pistole 38, another semi-automatic weapon from the Walther stable, entered service with the German armed forces in 1938 as successor to the P 08. It embodied a double-action trigger mechanism developed from the earlier Models PP and PPK, and also featured the signal pin which extended beside the hammer when there was a round in the chamber. The P 38 was mechanically reliable and in service was a popular weapon, being able to withstand extremes of temperature and inhospitable terrain (especially in the USSR), but was never produced in numbers large enough to allow complete replacement of the P 08. Manufacture was undertaken in Belgium and Bohemia-Moravia (occupied Czechoslovakia) as well as in Germany itself. There were a number of production subvariants, each differing from the baseline model only in small details, before the P 38 was taken out of production in 1945, and although the weapon’s manufacture became cruder as World War II progressed (a result of raw material shortages that affected the whole of the German armaments industry), the P 38 was always reliable. Indeed, so useful was the type that it was later placed back in production to meet the requirements of the army of the Federal German Republic.